No, you're not seeing double. This is my second post for today. I need your help. You see, recently I joined Kleenex Mums online. They were having a promotion where you had to nominate your favourite blog post from 2010. 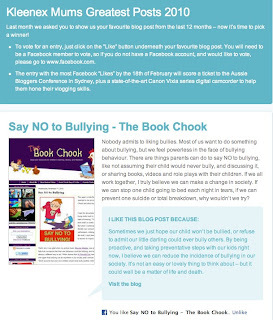 I nominated Say NO to Bullying, my post from November last year. Why did I choose that post? Well, I put a lot of work into it, even making a little movie for it at Xtranormal and suggesting kids might like to do the same. I got lots of supportive comments from lovely people, and the post was ranked highly in stats. But the main reason I chose Say NO to Bullying is because bullying is something I loathe. When I think of the consequences of bullying, when I see the look of fear on a child's face, or hear stories about people whose lives have been made miserable by it, I just wish so much there was something I could do to lessen its impact, and raise awareness about preventing it. So if you feel that way too, I am asking you to vote for Say NO to Bullying in the Kleenex Mums Contest. I hope this will spread the word a little further into our blogging world. All you have to do is to visit The Book Chook entry page and "like" my post (via a little "f" icon, for Facebook members which you can see at the bottom of my screen grab above) - estimated time taken is 5 seconds. If you'd like to encourage others to do the same, that would be great too. If you're not a member of Facebook, this won't work for you. I'm with you on this, Susan! That was a great post, on a very important subject. I'm looking forward to reading your picture book. I'm sure it's just as extraordinary as your blog!